Join me on upcoming Thursday evenings between 5:30 and 8:30 pm for some dancing in the street (and eating, and drinking, and playing...)! On July 14, I'll be set up on East Prospect Ave. (near That Bar and Danville Chocolates) playing a potent mix of your favorite summer songs. On following weeks I may be set up at different locations, but I'll still be somewhere downtown ~ just listen for the "Original" music (as opposed to the cover versions being performed by the various live bands). The 7/14 and 8/11 events will also feature Bistro Dining in the street (with 5 distinct courtyards presented by local restaurants), Wine & Beer Gardens (showcasing local varieties), a Kids Zone (with bouncy house, SRV Museum train and children's vendors), and 2 exhibition areas. 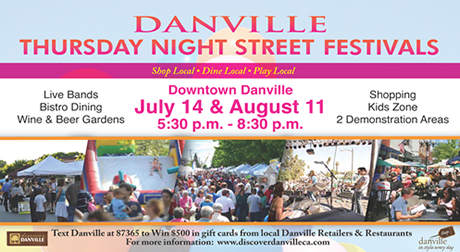 You'll also be able to shop right there in the street, with local vendors selling the best of what Danville has to offer! You can text "Danville" at 87365 to win $500 in gift cards from local Danville retailers and restaurants. On July 21 and August 18, I'll be set up along the fringes of Hartz Ave. during the massively-popular Hot Summer Nights classic car show. Get ready for a sock hop! Thursday nights are ROCKIN' in downtown Danville this summer!